Body Shop India has brought back all the winter specials in their shops! Was so delighted when I spotted Cranberry Joy and Spiced Vanilla in stores recently. I think they missed Jolly Orange this time but not sure as I saw its pic in the promotions. "Flavor Vanilla to pamper your Body : Treats by the Body Shop: Gloriously indulgent aromatic spices and oriental flowers are blended together to cocoon and pamper your body in pure pleasure this winter. 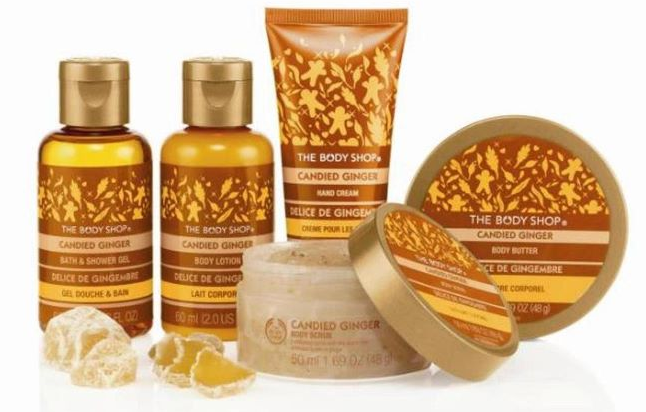 The Range consists of Spiced Vanilla Body Butter, Lip Balm , Body Scrub , Soap , Bath Bubble"
"Ginger Ginger and Candied ginger : Fresh on the scene is the new uplifting energizing Candied Ginger range. Known for its therapeutic qualities and combined with its sweet and spicy notes, this new fragrance is certain to warm and invigorate you this festive season." Limited Edition Cranberry is back: Due to popular demand this festive season. So what are you waiting for Indulge yourself in cranberry’s sweetness. The range consists of the following: Cranberry Joy Body Butter , Lip Balm, Body Scrub, Soap, Bath Bubble. "STEP NATURALLY INTO THE BODY SHOP - SPECIAL OFFERS FROM 9th DECEMBER 2011 - 4th JANUARY 2012. IN ADDITION TO THESE, WE MAY HAVE OTHER OFFERS IN STORES. PLEASE VISIT THE STORES FOR MORE INFORMATION. THESE OFFERS ARE SUBJECT TO CHANGE AT MANAGEMENT'S DISCRETION.OFFERS ARE VALID ONLY AT THE BODY SHOP INDIA." Loved the suitcase type box. Specially the print on it. In case you could not find anything, they even allow customizing your gifts but I might not like to buy a box for 70-300 INR. So are you going to pick anything from Body Shop? Might hit the CP or GIP one this weekend.